W2m x D1m / W6'6" x D3'6"
W2.5m x D3.5m / W8' x D11'6"
W3m x D5m / W10' x D16'6"
If you are looking for a wooden shed of superior quality and unbeatable value, then our garden sheds will fit the bill. 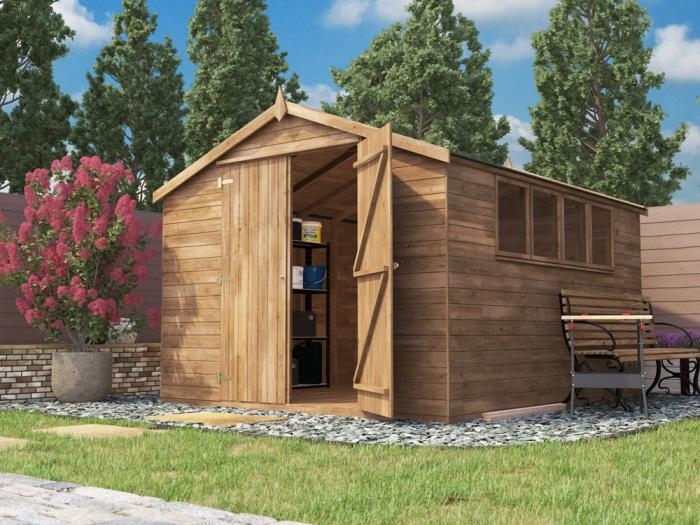 Our multipurpose storage sheds offer premium security and the extra space you need for your latest DIY project. At Dunster House we offer a massive range of single and double garages as well as carports in all shapes and sizes. 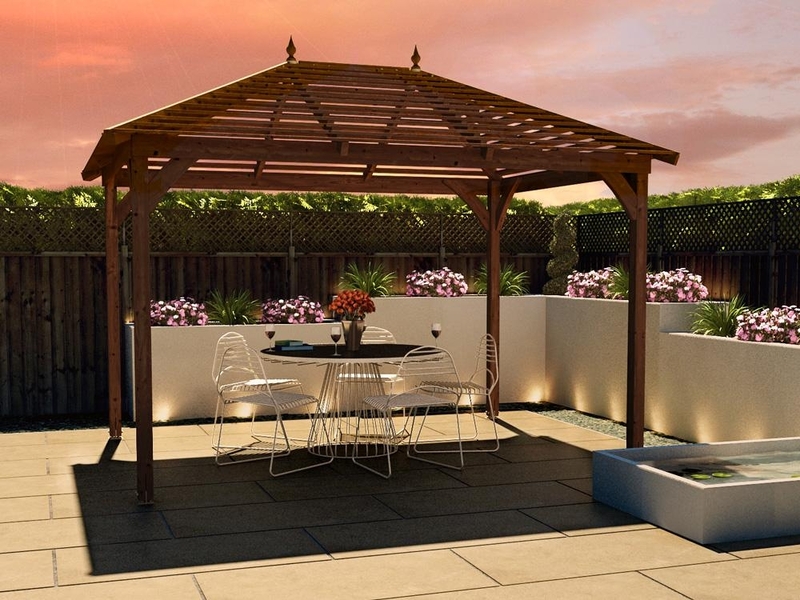 No matter the space you have in your garden and your personal preferences, our selection will not disappoint. Our single garages are enough to fit in small gardens but spacious enough for your vehicle to go in and out without worrying about damaging your car. The double timber garages provide ample space for 2 cars as well as some extra room for storage. 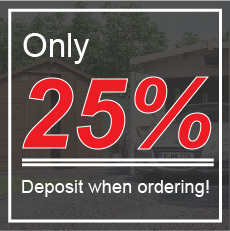 No matter which size timber garage you choose, rest assured your selection will last for many years to come with our premium features which are included as standard in the price. All our timber garages come with 4mm toughened glass in our windows and doors for increased safety and security. A much better alternative to 3mm horticultural glass, commonly found in garden buildings. Our toughened glass is a lot harder to break and if it’s ever broken, it breaks into small pieces rather than large shards. In addition, it’s also much harder to scratch than the plastic alternatives styrene, acrylic or Perspex. In addition to our fantastic optional extras that will help you personalise your wooden garage building to reflect your needs and style. Why not add decorative fascia to your wooden garage? Our Alpine style fascia pack is perfect if you’re looking for a stylish finish to your timber garage. Likewise, you can paint your single and double wooden garages with our high quality wall preservatives. Our range of colours will not only add character but also protect the timber from the elements and prolong the life of your garage. Tongue and groove sheds are a popular choice for garden sheds. This is due to the high-quality method of construction where a short tongue is cut using a router into the top of a piece of timber. It’s then slotted in to a corresponding groove which goes along the bottom length of timber. This method guarantees that our timber sheds are built to last. 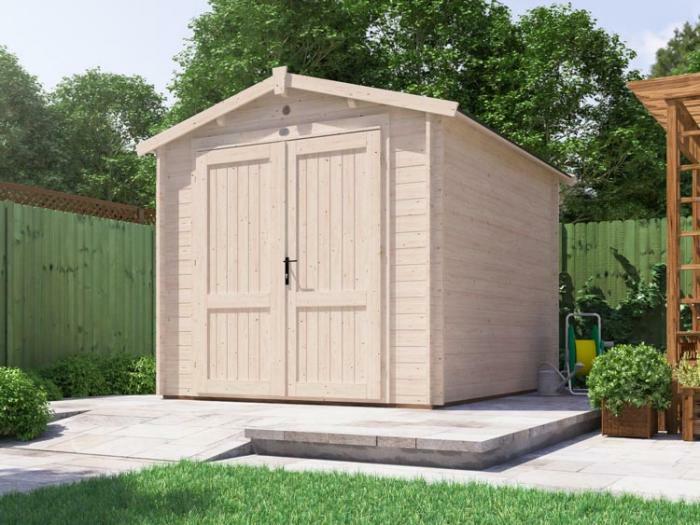 So, if you’re looking for a heavy-duty wooden shed, look no further than our tongue and groove sheds. 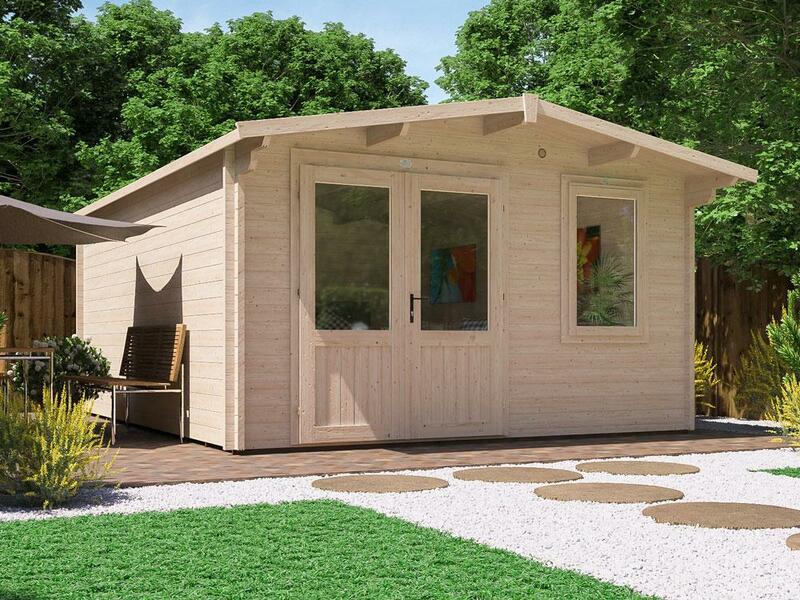 Unlike other sheds on the market, our garden sheds include many high-quality features as standard. All our tongue and groove sheds boast pressure treated timber along with a 10-year guarantee against rot and fungal decay. Go traditional with our wooden Dutch barns. The barn style roof, double doors and heavy-duty framework are a staple in our range of Dutch barns. Choose between a windowed and a windowless Dutch barn shed depending on what you’ll be using it for. If you’re looking to mainly store your garden tools, lawn mowers and bikes, then a windowless Dutch barn shed will do the job. However, if you like letting the sun in or will be working in your shed then a windowed wooden shed is a better option for you. If your garden shed contains your workshop, you want it to be as tough and hard-working as you are. Our windows and doors are made of 4mm toughened glass. The internally-beaded windows meaning your valuable equipment and tools are safe and sound. 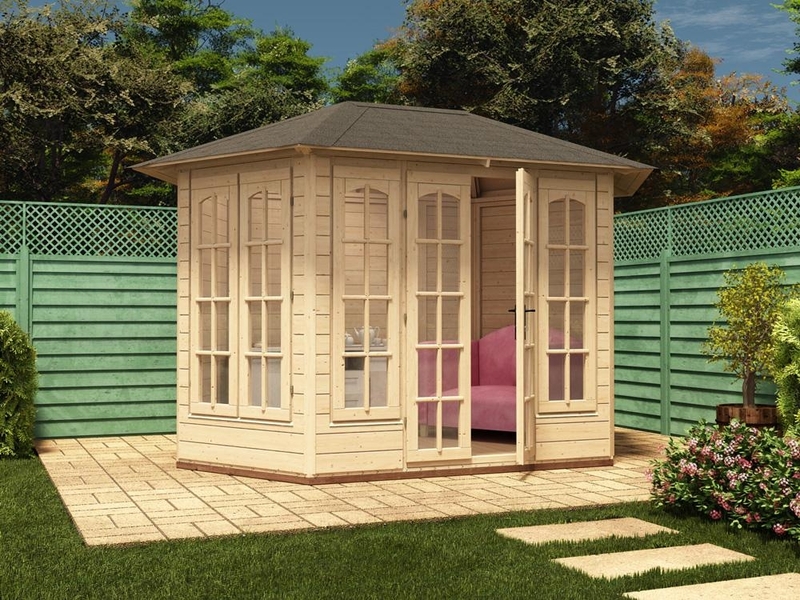 If the space in your garden is at a premium, consider our 3-sided pent sheds. 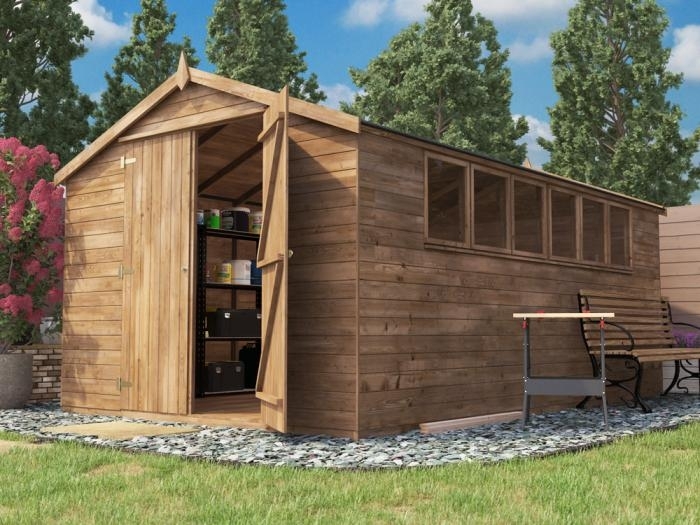 Even though it’s a small lean-to shed, it doesn’t lack the space to store your garden tools, bikes or garden chairs. Simply attach it onto an existing wall and you’re good to go. 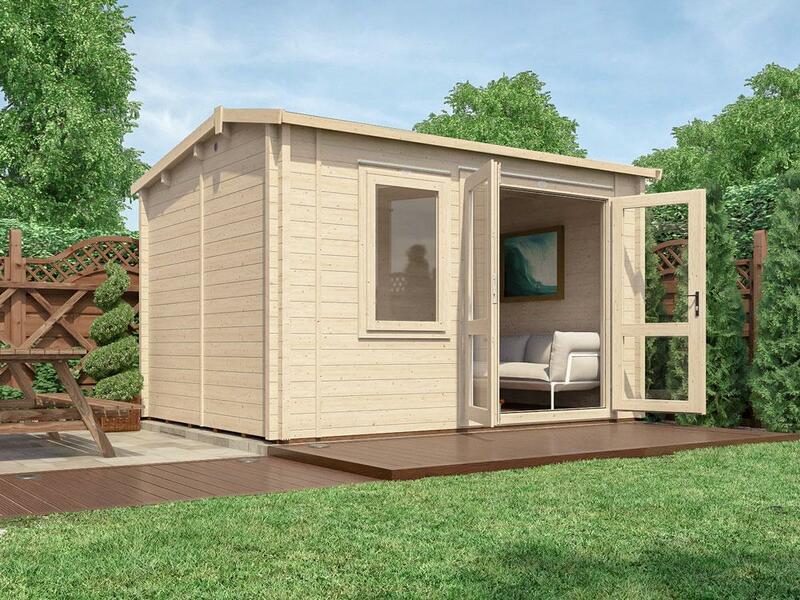 Our 3-sided pent shed are available on both left and right hand configuration. The external timber used on our pent sheds is pressure treated which enables us to offer 10-year guarantee against rot and insect infestation. The roof is made from Wood Plastic Composite (WPC) which is a hard-wearing, low maintenance material. The floor is made from Multi-Functional Panels (MFP) which is water resistant. 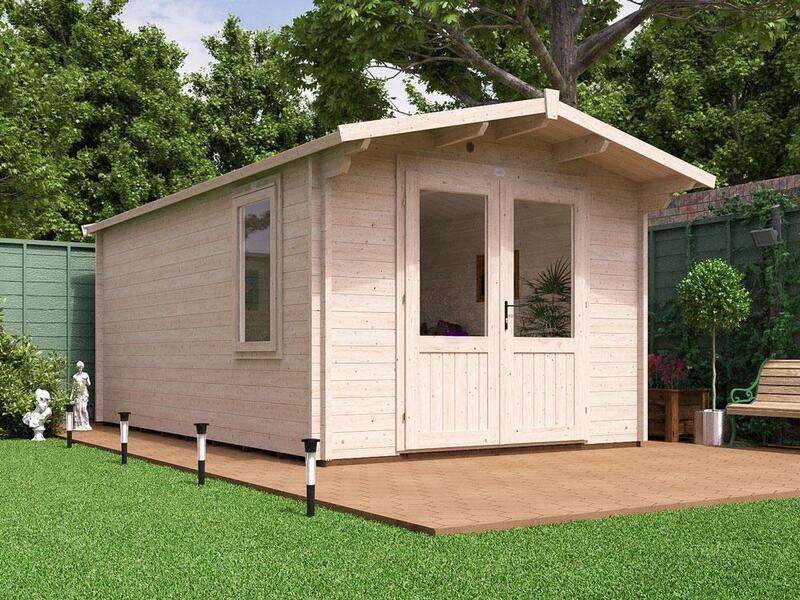 Like many of our sheds, the 3-sided lean-to sheds are made from 15mm shiplap cladding. This means the timber can expand and contract with the seasons and not create gaps. The curve of the cladding enables water to run off easily and protect your tool shed from dampness. A she shed is a popular shed use. It is essentially a dedicated space for women to use it as they please. Many of our customers use them as beauty rooms for themselves or as their home business, craft rooms etc. Many of our cabins are used as beauty salons, hair salons, eyebrow bars and more. Imagine having your own bar in the garden. This is your own time, to spend the way you want to, so grab a brew, put on the music and make yourself comfortable! We have a huge range of man sheds, and though they all feel tall and spacious, most of them are under 2.5m in height, which means you don’t require planning permission to build your bar where you want. Bye, Bye designated driver! Not only can you choose the music and the guests, but it is also really useful for family and social events. Want to invite the entire extended family for a birthday celebration? Or a noisy New Year’s Eve party? Now you will have the space at last, without having to move a stick of furniture! Our bike shed is not your average bike shed. Ours is designed to protect your bike, garden equipment and tools from the elements as well as prying eyes. 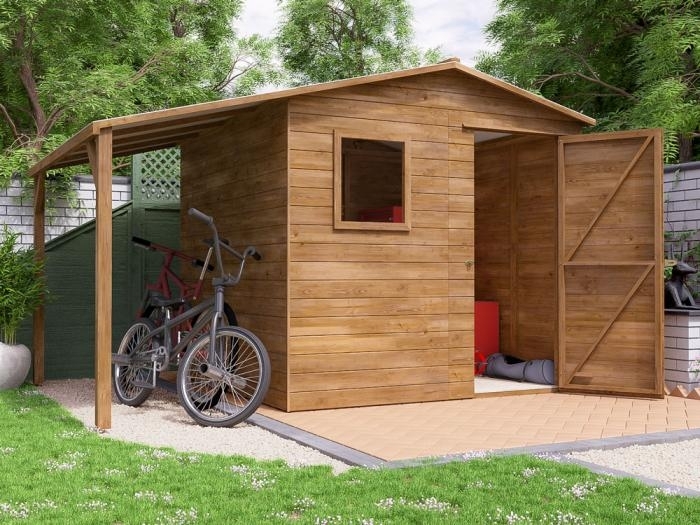 The Arianne bike shed features roofing felt pre-attached to the roof boards, wide opening doors for easy access, secure hinges, hasp and clasp locking system and MFP floor and roof. It also boasts a robust sub-frame and 15mm shiplap cladding. All timber is pressure treated for longevity and comes with 10-year guarantee. Have you got a lot of logs and nowhere to store them? Opt-in for our log store solution to protect your logs from the elements and keep your garden nice and tidy. Building your own log storage is a great opportunity to showcase your DIY skills or even put your skills to the test. The outcome will definitely be worth your while. You will not only be protecting your logs over the winter, but you will also be saving yourself quite a few pounds when the dreaded heating bill arrives. Our log storage is a sturdy, easy to assemble and attractive timber structure. Our wood of choice, spruce timber, is pressure treated to ensure that it will last longer and resist rot. We take pride in only using full lengths of spruce in our products. We don’t glue offcut pieces together with finger joints. This means, our log storage is not only stronger but it looks better too. No more unattractive bins being tossed left and right in your garden. You can now hide your bins and recycling boxes with a stylish wooden solution from Dunster House. Our wheelie bin stores are available in two sizes, the triple and double wheelie bin store. The triple wheelie bin store is ideal for hiding three, 240 litre bins. The double wheelie bin store fits two, 240 litre bins. The generous interior volume of the wheelie bin shed means that there’s plenty of room to move a standard 240 litre bin into position or wheel it out. No more squeezing bins into tight spaces! Both wooden wheelie bin stores have latched front doors with no lower frame, allowing the bins to be easily wheeled in and out of the storage space. Making it a breeze to get them in and out in a hurry. In addition, it features slatted walls, doors and roof built onto a solid framework. The heavy-duty framework is able to withstand harsh weather and rough handling. The rear wall panel supports a free-standing position of the wheelie bin storage. This means it doesn’t need to be near a wall, fence or hedge. Another great feature is the wooden stay arm that swings out into place as you open the roof panels, holding them safely in place. So, you can use both hands and not strain yourself when placing items in the bins. 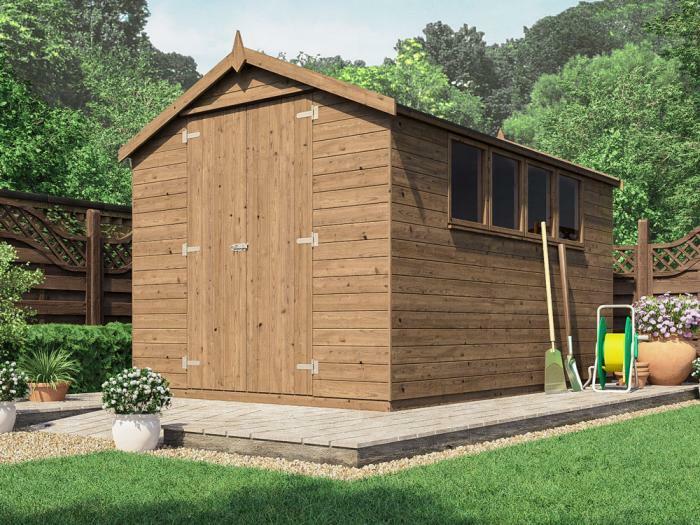 Our garden tool and mini storage sheds are the perfect alternatives to a large wooden shed that makes up all your garden space. 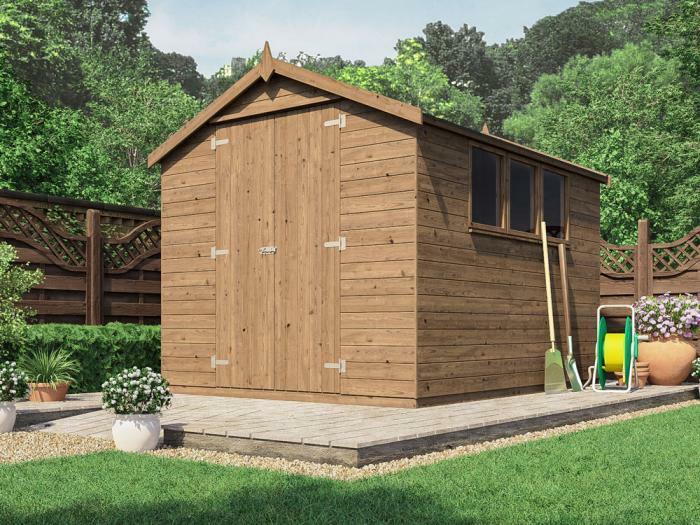 If you have limited space in your garden but you need somewhere to store your tools or small garden items, look no further than our mini storage and garden tool sheds. Both of which are made with high quality slow grown spruce timber. 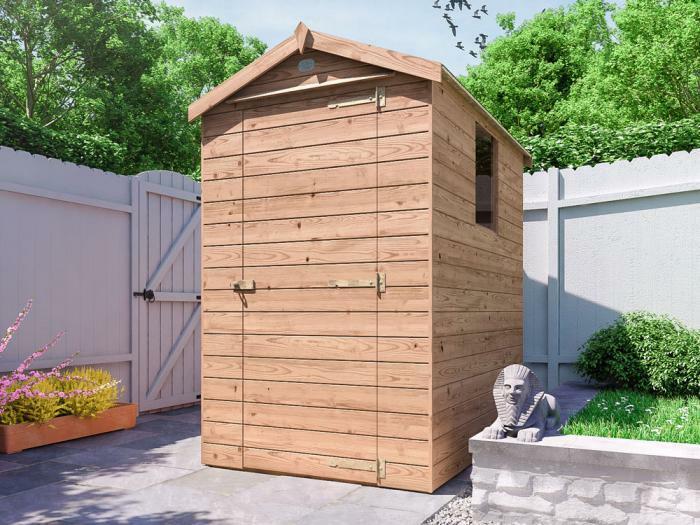 Our practical garden tool shed provides maximum storage in minimum space due to the generous 2.11m (6’ 11”) height. No need to ‘duck’ to access your belongings or even wedge them diagonally into the tool shed. The addition of the tool rail at the rear of the wood shed is useful as you can fix a hook into it to hang your tools and any other objects. Another great feature that helps maximise space and minimise clutter. 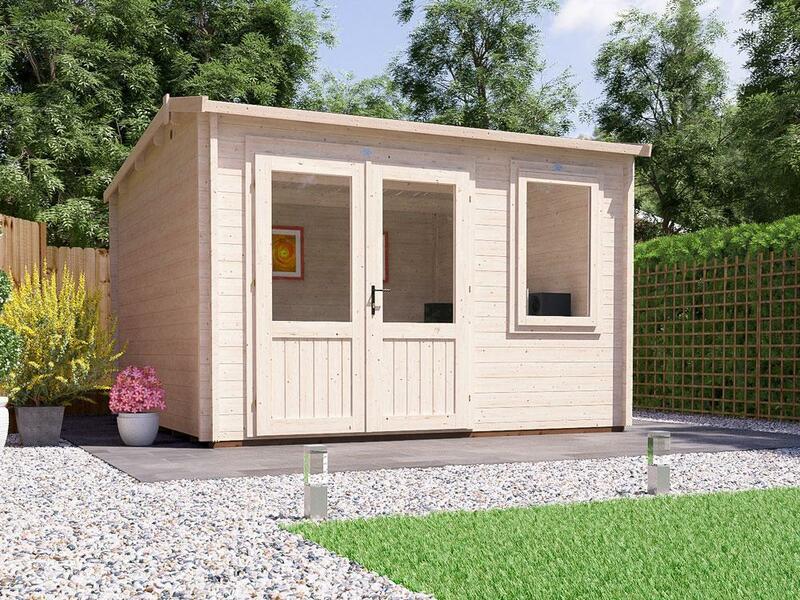 The mini storage shed is another small but functional storage solution for your garden. 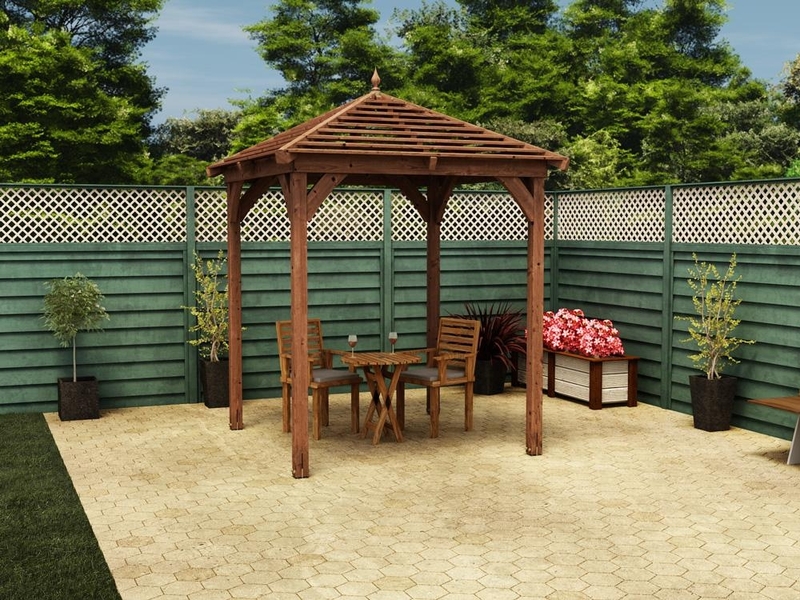 It’s ideal for small gardens or patios where space is at premium. 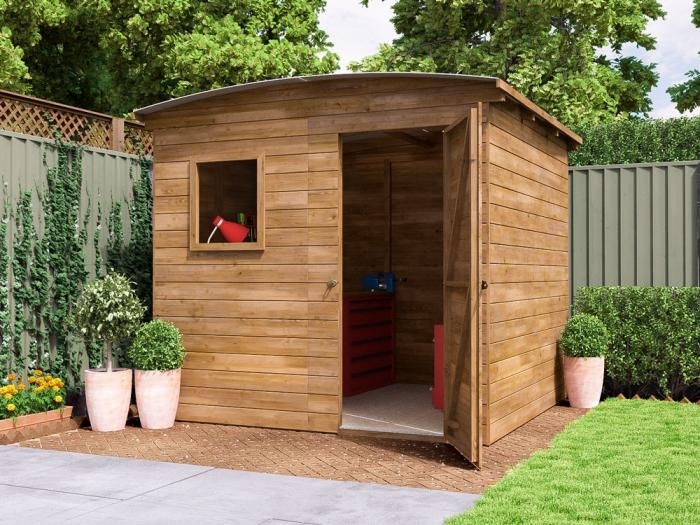 A small wooden shed will tidy up all the loose garden tools and children’s toys you may have laying around. The walls are made of 12.5mm shiplap timber and the double doors provide full width access. The small storage shed comes fully pressure treated and protection from rot and insect infestation for up to 10 years. To ensure your timber shed has a prolonged life, it’s crucial that you take the correct measures to maintain it properly. The key areas to focus on are the base and shed roof. Along with inspecting the base, it’s vital that you check the roof of your garden shed as well. We recommend checking for damages annually. If you find any wear and tear on the felt of your roof act on it as soon as possible as leaving it will cause more damage to the wood shed and its contents inside. In case you have to remove the damaged felt, it’s advisable that you wear safety gloves and goggles. Proceed by locating all the nails that are holding the roof felt in place and then pry them loose using a claw hammer. If a nail head breaks off, hammer the nail into the wood as deeply as possible so that there are no sharp points protruding through the wood, which could potentially tear the new felt. Last but not least, it’s important to protect your garden shed against damp and moisture. 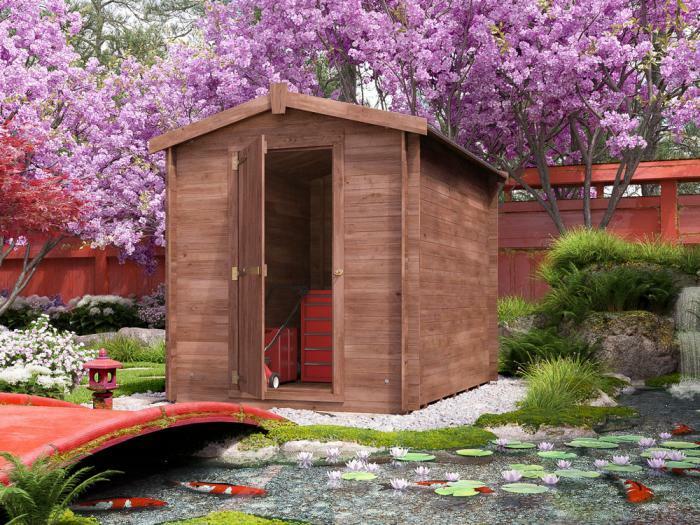 In order to do so you have to ensure your shed is in the best possible position within your garden. Water which consistently drips from leaves and branches can cause serious damage. Therefore, we recommend taking regular measures in cutting back any overhanging trees which are close to your wooden shed. For more information, take a look at our how to maintain your wooden shed guide. If you’re looking for a superior alternative to a brick garage then our wooden garages might just be what you’re after. They are not only cheaper but built with the highest quality materials and include features that others may not offer. Add space and value to your home with premium quality wooden garages. 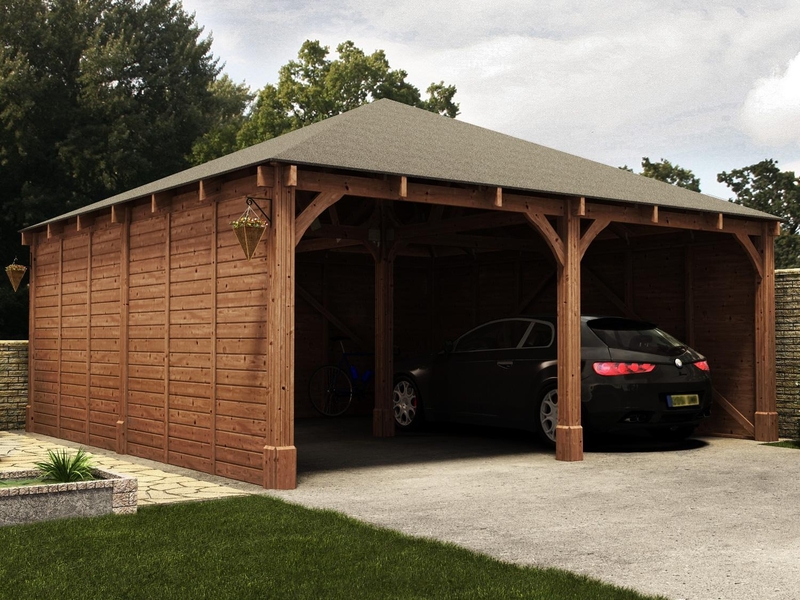 Our wooden garages are made with slow grown spruce and pressure treated perimeter bearers that protect the lowest part of the garage against rot and insect infestation for up to 10 years. We know how important it is to prevent condensation build up in your wooden garage building. For this reason, we have included ventilation as part of our timber garage kits. We use two pairs of plastic base plates, one round and one square. The external round vents are chamfered to help direct water away from the hole, the inner square vents have an integral fly screen to prevent insects from entering through the vent. The pair of vents allows a flow of air through your garage to help keep out musty smells. Our pressure treated garages are the ideal solution for your car, motorcycle or gardening equipment. However, don’t confuse them with our range of timber garages. Our pressure treated garages boast an important difference to our massive range of timber garages and workshops. That is, every piece of timber is pressure treated, not just the perimeter bearers. Pressure treatment is a much more costly but effective form of treatment compared to dip treatment, as we use a large tank that uses high pressure to force treatment deep into the wood. We take the extra step and pre-cut the timber before treatment so the ends won’t be exposed. Due to this, all of our pressure treated timber carries a genuine 10-year guarantee against fungal decay and insect infestation. Lean to wooden carport are perfect if you’re struggling for garden space yet you still need to protect your vehicles from the unpredictable elements. Despite being both economical and space-saving, it doesn’t mean it lacks in quality. Our lean to carports feature a sloped roof that allows the rain and snow to run off without allowing puddles of water to form. In addition, the lean to carports are made from pressure treated timber which ensures the structure remains free from rot and insect infestation for 10 years. Our wooden car ports offer easy access to your cars and vehicles without having to worry about opening and locking doors behind you. A heavy-duty solution with full pressure treated timber that will stay free from rot and insect infestation for up to 10 years which is something not many competitors can offer. We only use full lengths of timber in our wooden carports and timber garages, which is something we’re proud of. We don’t glue separate offcut pieces together with finger joints. You can rest assured that our wooden carport kits will not only be stronger but look better too. Home improvements and DIY projects will never be easier if you have one of our own workshop garages to house them in. Enjoy your hobbies in your own space and free up your home from garden tools or leftover bits of craft. Our garden workshops will impress you with their high-quality features such as the adjustable storm braces that tie the garage roof to the rest of the building. This way, the workshop building is able to withstand stronger winds and allow for the natural movement of the garage which helps prevent gaps appearing between wall logs as they settle and move. Additionally, our wooden workshops come with either 2 or 4-point locking systems. Our industry leading 4-point locking system features a hook, locking latch and two roller locks. Whereas the 2-point locking system benefits from a hasp and staple fastener which is fitted to the garage door. Our experts recommend choosing the right treatment for your log cabin garage and that you treat it as soon as it’s built. At Dunster House, we offer a variety of wall preservatives that are solvent and water based. In addition to selecting the best log cabin treatment, it’s also important that you re-apply treatment when required. This will depend on the log cabin preservative you have chosen. Furthermore, creating an environment that aids moisture control is an important element in maintaining your log garage. Make sure measures are in place for the roof, foundations and surrounding drainage to help shake off extra moisture and prevent rot and insect infestations. We use pressure treated perimeter bearers to protect the lowest part of the building. We use a large pressure treatment tank that forces the treatment deep into the timber at high pressure. Due to this effective process, we offer our customers a genuine 10-year guarantee against rot and insect infestation on the bearers. To ensure no gaps form between logs, our wood garages feature adjustable storm braces. The storm braces attached to the wall logs can be tightened or loosened to allow for the timber to settle. Don’t forget, your garage is made of timber, a natural product that will contrast and expand according to the UK’s unpredictable weather. Once the timber garage is erected, there will be a period of “settling” as the wood reacts and adjusts to surrounding climate. Splits and cracks may occur over time but that shouldn’t compromise the quality of your garden building. For more information, take a look at our how to maintain your log garage guide. You may have found exactly what you’re looking for, a wood garage to your exact taste and measurements. That’s great! However, before placing an order for your garden garage, it’s important to familiarise yourself with any planning permissions or building regulations that may apply in your area. The good news is that most of our log garages and carports don’t require planning permission. This is due to our unique designs that utilise the maximum width and height available to us. Giving you as much space as possible, without the need to opt for tall garages. Although we have a wide range of under 2.5m high log garages, some exceptions may still apply. This is why it’s vital that you check whether you’ll need planning permission or not. Do you have what it takes to build your own timber garage? Building your own wooden garage can be overwhelming, we get it. Although we design all our wooden garage buildings and carports with self-assembly in mind, we understand that not everybody is confident with DIY. For ease of mind, we offer our own, directly employed, installers to carry out the installations for you. 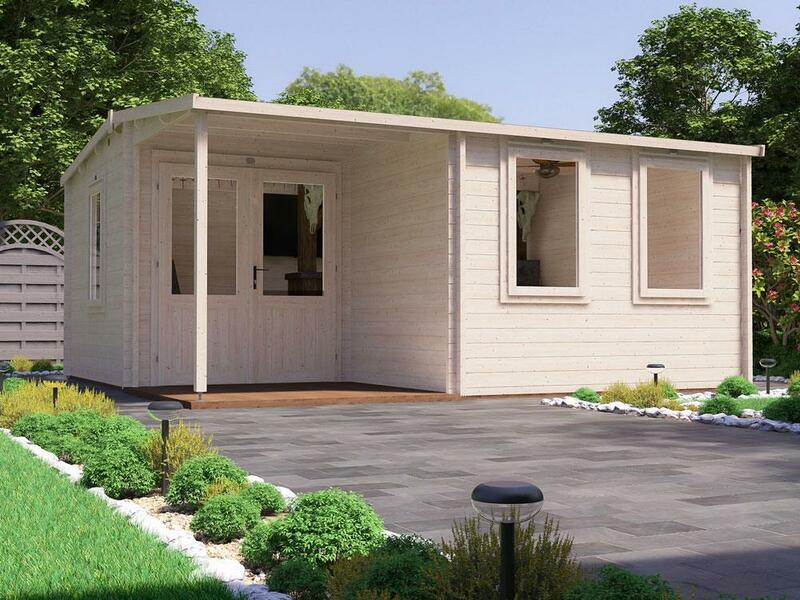 Visit our garden building installation T&C guide for more information. If you’re looking for a wood garage or shed to buy, make sure you do your research. 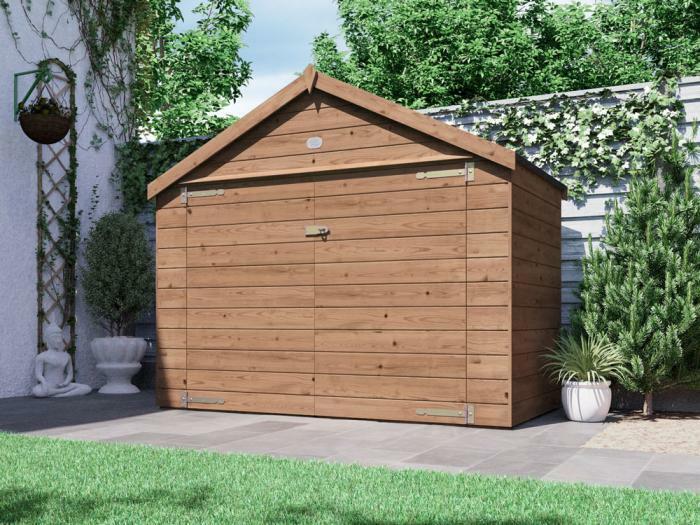 This is because garages and sheds come in all shapes and sizes to fit all budgets. You may be looking for a small log garage if you’re restrained for space. 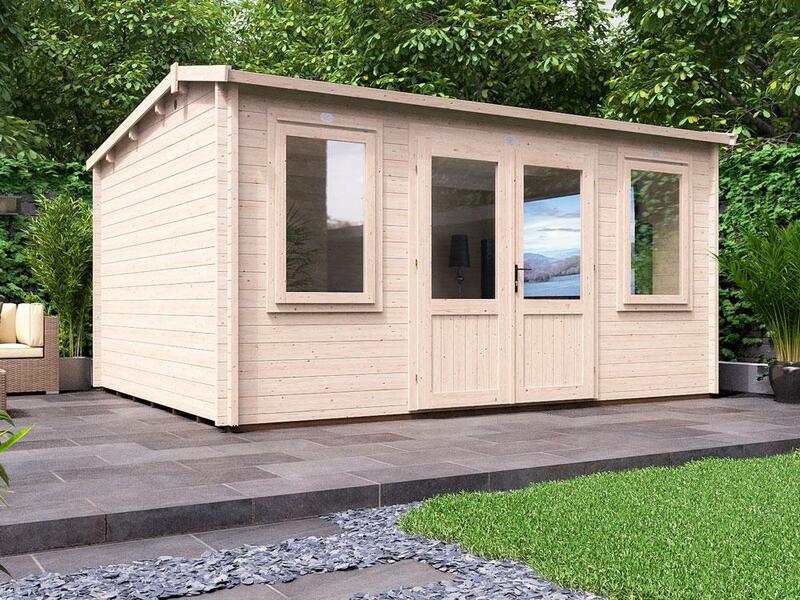 Likewise, you may be looking for a large shed if you’re aiming for a multipurpose space or have a large garden. 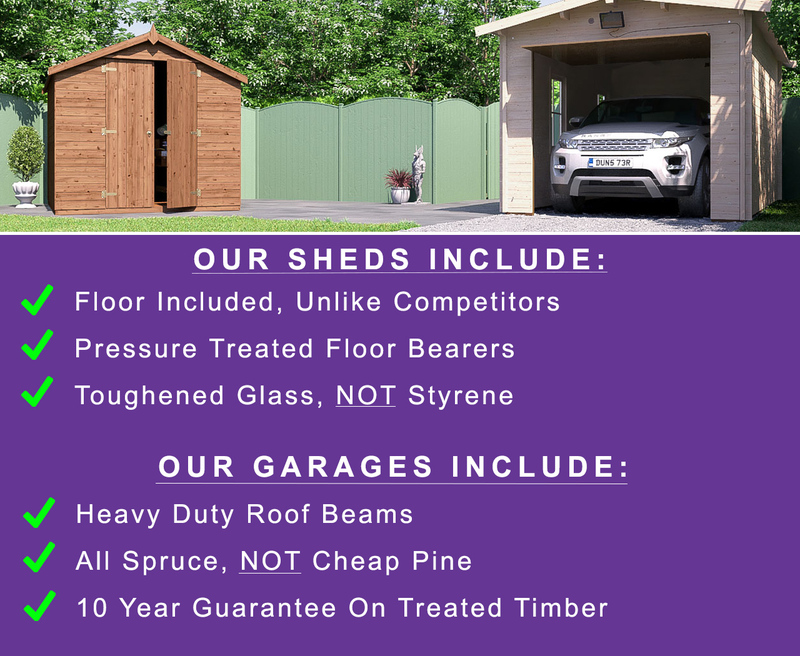 Whatever your budget, garden space, personal taste and style, if you are looking to buy a timber shed or garage, we are confident that you will find what you’re looking for in our massive range of timber sheds and wooden garage kits. 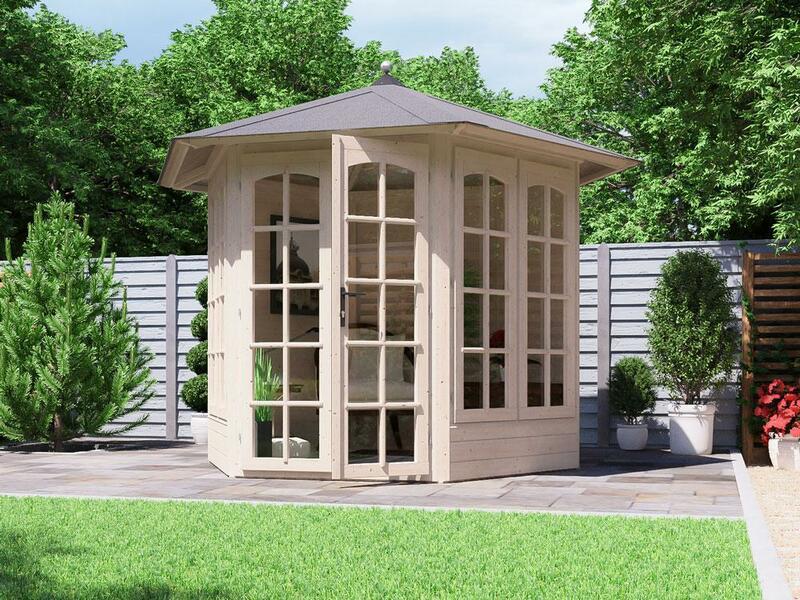 If you’re looking for the best garden outbuilding you’ve come to the best. 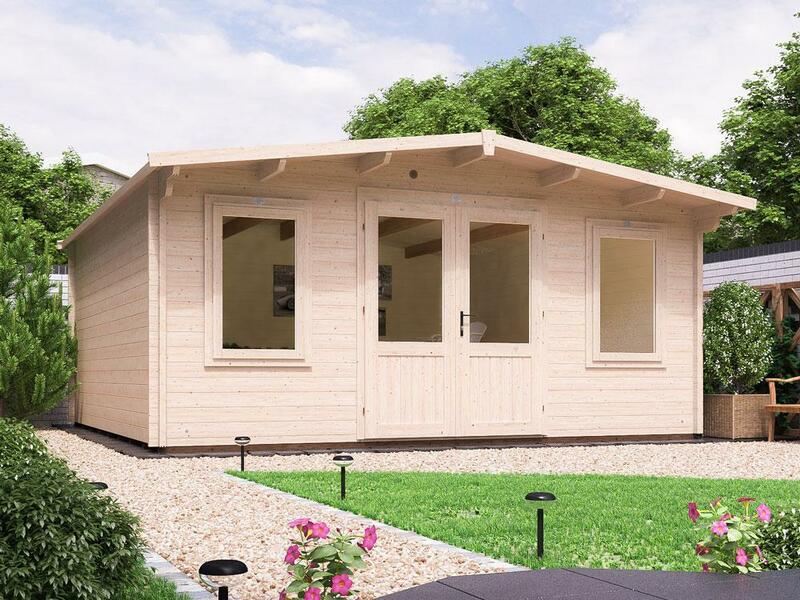 As the UK’s No.1 Garden Building Company, our garden outbuildings are without a doubt the best quality and value for money you will find, anywhere. Head over to our customer reviews page for hundreds of glowing reviews from satisfied customers.